Breathtaking, empty and open to Arctic swells, Lofotens wave battered coastline is a rare surfing frontier. It is the perfect backdrop to learn with friendly waves, while the more advanced surfers can enjoy world class waves on the surf breaks further out. Unstad beach is facing north-west while the predominately wind and waves are W/SW, which gives the place mostly offshore winds. The lack of daylight during winter months in November to February make this place a challenging surf destination. The flip-side being almost continuous light throughout the summer. From mid April to late August you could surf 24/7. Unstad has a lot to offer for surfers at any level, all year around. 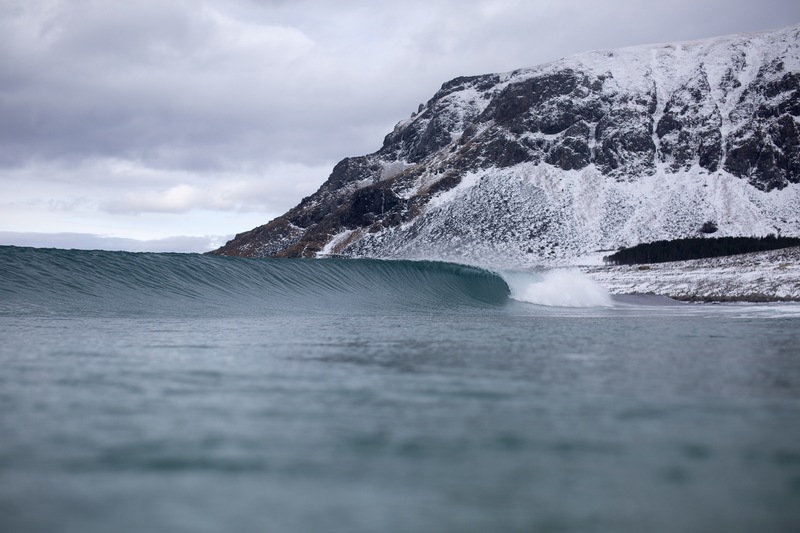 Surfing in the arctic requires surfing in thick wetsuits, boots and gloves. The average water temperature is between 8 - 14 C in both summer and winter due to the gulf stream current. However during summer we usally use slightly thinner wetsuits and also dropping the gloves. Depending on when you are travelling to Unstad, you need to bring both boards for your normal surfing and also a nice board that could handle a slightly heavier wave. If you are not interested in traveling with your own board, dont worry - we have a wide range of boards and wetsuits. Check out our surf rental deals here. 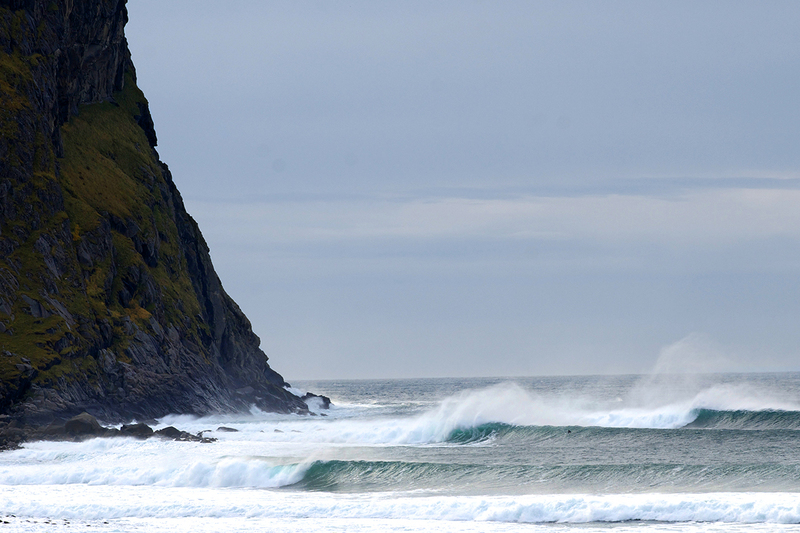 Unstad bay consists of four main breaks that make it a perfect surf spot for both gofy and regular surfers. The bay is also one of the first breaks in Lofoten that picks up swell from any directions. "- a high performance wave with a lot of power and push"
Søppelplassen or the "garbage dump" is a long holding lefthander offering both tuberiding and performance. This is the place to be when it gets big at Unstad. Needs proper swell from SW to NW in the 10 ft+ range. Just getting bettter and better as the period increase. Strong rip current. Difficult to get out between the rocks and also difficult to get in again. Fast and barreling are keywords to describe the left at Unstad. This wave is the goofy footers dream when it is firing. Breaks over shallow water but still pretty safe from the rocks in front of the parking lot. Works on almost every swell directions but will peak best on southwest. Needs about 3 feet, but just getting better as the swell increases. Strong rip current. Look out for rocks when its small. Paddling out through the rocks could be dangerous for your finns. The beach break at Unstad is a fun and playful wave that will keep you busy all year around. Due to the always changing sandbars, there will multiple peaks around the beach. This gives the beach everything from world class tube rides to slow and mellow longboard waves. The beach break depends on the tides. Probably one of the most consistent waves in Scandinavia. Works on almost everything. Only need about 2-3 ft swell. Normally best on lower tides. First timers - intermediate - advanced. Strong rip currents on both sides. Probably one of the best righthanders in Norway. The wave breaks in front of big rocks that surrounds Unstad bay. Offers both barreling tube rides as well as a long shoulders for performance surfing. Need some proper swell from W/SW. Starts working properly around 4-6 ft and holds swell up to 10 ft. Works best on low - mid tide. Rocks. Be careful if entering the wave from the rocks.